I love to quilt…mostly not huge quilts…although I have made some of those…but I love smallish primitive wall hangings…and lately I have begun to work with felted wool applique…it is so much fun for me to cut and sew bits and pieces together into something unique and wonderful. My love for anything pumpkinish knows no bounds…I just love this time of year when I can put handmade pumpkins all around the house. The only awful thing about Fall on the East Coast is that it is often hot and humid…like today’s 94 degrees. My felted wool is sticking to me as I stitch away. But that is not stopping me…I want to make a pumpkin a day until all of the pumpkins in this photo are all done. Lucy complicates my stitching because she tries to attack my thread every time I take a stitch…she firmly believes she is helping me. But one pumpkin is nearly done…one more eye and he is ready for displaying. Those pumkins are adorable. I wish I had more time to made them. Oh my GOSH! 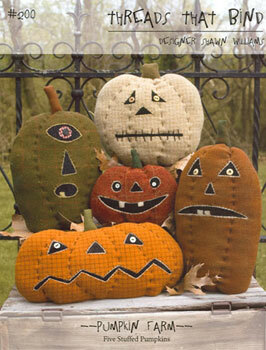 those pumpkins are SOO SOOO SOOOO cute! !